I spent most of the morning running errands/shopping with my best friend, with our only sustenance an eight-ounce eggnog latte (eggnog lattes have not yet left the coffee places in their seasonal migration). I’m home, I’m tired, and I’m dining on…. One cup of spinach, one cup of red cabbage, a handful of mixed nuts, and some Newman’s Own Low-Fat Sesame Ginger Vinaigrette. This is not because I’ve read the latest diet book—or have I? I’m over halfway through Michael Pollan’s wonderful In Defense of Food: An Eater's Manifesto , and I’m eating real food. Not too much. Mostly plants. As a young woman I had a fairly typical obsession with my own weight and the foods that made it go up or down. I drank Slim-Fast, ate Ayds (remember those? Chocolate-flavored diet candies that were supposed to squelch your hunger pangs), and took diet pills on occasion. I’ve never been big on drinking soda, thank heavens, but when I did it was always Diet Coke, not regular Coke. I’ve long since moved past that to a healthier relationship with food, in which it is here to sustain my health and to be enjoyed. My daily session with the scales now is meant to measure my progress in bike training for a more efficient power-to-weight ratio (less flab means more muscle to push up the hills). I think we eat fewer processed foods than most U.S. households. My mac and cheese doesn’t come from a box (but Eldest Daughter’s does—she loves mac and cheese from a box so she buys her own). Sweet Husband makes a killer-good marinara from scratch. Because I make terrific soup, I haven’t had canned soup since I was a kid and Mom fed me Campbell’s Chicken and Stars when I got sick (I do get nostalgic for the little stars). But I’ve succumbed to the “nutritionism” that Pollan writes about in some ways: a reductionist view of food in which it becomes only its constituent parts, and then only the constituent parts that have been analyzed successfully in a lab. I buy skim milk and low-fat yogurt. I have sugar-free hazelnut-flavored sweetener in my cupboard for my morning coffee. There’s a bag of ground flaxseed in the fridge so I can add a spoonful of omega-3 “good fats” to my fruit smoothies, and soy protein in the cupboard to use in place of flour as a thickener for “cream” sauces (made with fat-free evaporated milk and pureed white beans, not actual cream). In making substitutions to turn a meat-a-tarian recipe into a vegetarian version, I use the occasional meat analog made from textured vegetable protein, a highly processed soy product. I don’t make New Year’s resolutions because those are a set-up for failure. I do a little reflection, though, during this quiet season where we pause in the cold and dark before the earth turns toward the sun again (in my hemisphere). I’ve come partway toward where I want to be in my relationship with food. The rest of the journey will be fueled by real food, and it will be delicious. This blog is headed BiketoWork Barb, but that’s sort of a label for who I am--I don’t write about cycling in all my posts. Lately I’ve been enjoying the privilege of being a guest blogger at Cycling Spokane, and I thought I’d share some of that bike-blogging energy here by linking to those posts. Baby it’s cold outside! Fish Lake Trail Dec. 27, 2009: Complete with pictures of my bike-bloggin’ sweetheart Eric and my frozen self, this post describes our cold 29 miles on the new Fish Lake Trail. Complete Streets for Spokane? Takes a look at what it would mean for Spokane to get Complete Streets. There’s a meeting coming up Jan. 13, 2010, 5:30-7pm. Mark your calendars and be there so we can get started making streets that work for all users. Hint: It’s the first word in the Boy Scout law (no, not brave or clean): Talks about the importance of trust on the streets. For those of you now stressing out because you have—once again—failed to create the Perfect Christmas Of Your Child’s Dreams Through Gift-Giving, there is aid and comfort. They. Won’t. Remember. Truly. At least, if my memories are anything to go by. Oh sure, I have an overall Christmas memory blur, just like my overall summer vacation memory blur (which includes swimming lessons, sun, and sleeping out on the lawn that time the mouse climbed into the battery case of my radio and I put my hand on it in the night, screamed, an d flung the mouse far, far away. He was probably as scared as I was. Maybe. Wait, where was I again? Christmas. Right.). Other things in the blur: Christmas cookies, especially the buttery-good spritz ones. My mom made a huge assortment of cookies, aiming for artful variety in flavor, appearance and texture. Pie: pumpkin, apple, chocolate. Big traditional meal. Decorations. Lights. Specific ornaments, some of which I now have since I did the bulk of sorting out when my folks downsized to assisted living (so if you’re one of my five siblings and you’re wondering where the two elves went that used to sit on the tree branches, now you know). But gifts in the memory bank? Two. With year after year of careful selection, Mom counting gifts to make sure my younger sister and I received the exact same number (I used to joke that she would wrap mittens in separate boxes if she had to, to make it come out even), all that anticipation—two. The Hoppity-Hop is an easy one to remember for a couple of reasons. One is that I woke up that Christmas morning with my first-ever stiff neck. We’re talking seriously stiff, can’t-climb-out-of-bed-by-yourself stiff, cry-when-you-try-to-move-anyway stiff. My older sister, who’s ten years older than I am, had to help me out of bed. The house we grew up in had a curving staircase. The upper part was walled in, the lower part curved down to the main entrance. 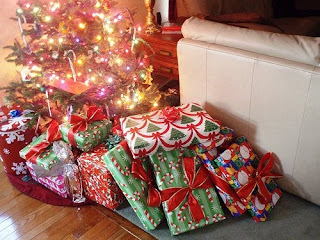 Once you got past the corner with the funny steps shaped like pieces of pie, you could look into the living room where the tree stood, surrounded by Santa’s generosity. My older sister held me by the shoulders as I walked down the stairs, saying repeatedly to my younger sister, “Now don’t SAY anything when you see the tree. Don’t SAY anything.” She knew what sat there and she didn’t want me to turn my head abruptly. We got around the corner. Little Sister screamed, “Hoppity-Hops!” and I started to turn my head so I screamed for joy and pain as Older Sister quickly whipped my whole body around so I could look at the tree. Yep, Hoppity-Hops! THE gift that year and a ton o’ fun—not that I could bounce on it until after my stiff neck cleared up. It was a ton o’ fun, that is, until the following summer when one of my older brothers—who was probably about 17 at the time—went bounding across the lawn on MY Hoppity-Hop, leaping higher and higher, laughing joyously, rediscovering the freedom of childhood…. Right up until my Hoppity-Hop popped. The guitar I remember because my clever gift-giving mom wrapped an ordinary box—the size that you secretly think is a little disappointing because it probably holds a hat and scarf set—full of tissue. As I sorted my way through the tissue, I wondered what in heck this gift was—heck, where in heck this gift was. I finally found a little piece of paper. As I looked at it, my sharp-as-a-tack brain slowly registered that I was looking at a cut-out picture of a guitar. The meaning of it dawned on me just as my mom sneaked back into the living room with the real thing behind her back. I’d been asking for a guitar (Hoppity-Hop-popping Older Brother played the guitar) and I was so excited to get it. I took lessons for a year, maybe more; never got as good as Older Brother; finally decided I’d keep on with piano but not guitar. I don’t know where it ended up; I kept it around for years, thinking I’d play it and every once in a while reconfirming the fact that I no longer had any finger calluses. So with all the selecting and wrapping and bill-paying, just know that you’re mostly creating a happy blur. Which is nothing to sneeze at, mind you. Now, this particular person is actually someone I do believe is frank in these statements. It’s just a verbal tic. My theory: There is something about asserting one’s truthfulness specifically that makes me notice—and question—the sincerity of the word being overused. Frankly, honestly, methinks the lady doth protest too much. I live with a house full of people who enjoy a good laugh, and who can fire off a quip that will leave us all in stitches—the kinds of things that make me laugh until I cry. Sometimes it’s a turn of phrase, sometimes it’s a reference to a line in a favorite movie that we all quote in sync, sometimes it’s an involved word-play pun thing requiring extensive inside knowledge of family stories. When someone says the line, “You don’t know,” we all simultaneously cry out “You don’t know!”, hold our breath, and cover our heads with our arms. This, of course, is Guy Fleegman in that great classic film Galaxy Quest, when they land on the alien planet to get the beryllium sphere and Fred Kwan opens the hatch. When someone refers to pain, we say, “Life IS pain, princess. Anyone who says differently is selling something”—from that other great classic filmPrincess Bride. If it’s a discussion of money, someone is bound to say in a semi-strangled voice, “Give me the cash!” and do a little dance, like the guy who tries to hold up Korben Dallas in Fifth Element. Note that this is NOT the same thing as saying “Show me the money!” like Rod Tidwell in Jerry Maguire. Perhaps my favorites, though, are the straight lines. Sweet Husband (pointing to new building in a neighborhood we drive through frequently): Look, there’s a new office building. Me: I wonder what’s in it. 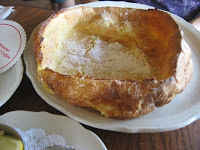 Me (experiencing a craving for those puffy little pastries with the powdered sugar and fresh lemon while snuggling in bed with said Sweet Husband one weekend morning): I want a Dutch Baby. Sweet Husband: But I’m not Dutch. Sweet Husband and I are seated in the dining room, working away on our respective laptops. We hear an odd snapping sound from the living room and look at each other. That’s the kind of thing that cracks people up around our house.